Doing regular empties posts has made me a lot more aware of consistently using products until they're finished and I've actually managed to use up a good number of things this month. I even somehow managed to finish four (!) different lip balms! This is one of the best lotions I've used. It doesn't contain any water, just lots of nourishing oils and butters, so it's intensely hydrating. It also absorbs quickly and doesn't leave you feeling greasy like a lot of other water-less lotions. It's a little pricey at $25, but you need less product, so I figure it basically evens out. This sample of the Vanilla Mint was included in one of my orders and I'm a little mixed on the scent. I loved it in the jar and I think it'd work really well for something that gets washed off, like shower gel, but it became overly sweet and cloying on the skin. Repurchase? Yes, but not in this scent. Sassy Minerals isn't around anymore, but they used to be connected with Lauress Cosmetics and last I heard, some of the Sassy colours were now available through them. Panache is a pretty peach that used to be a favorite, but when I pulled it out again this month, I found it leaned a little too orange for my liking. Longcat is a white/silver shimmer in a clear base, but I used it more around the house as a lip balm than as a lip color. I've gone through several tubes before and never had this issue, but in this one, the shimmer wasn't incorporated evenly. It was very light at the top and then full of shimmer and gritty towards the bottom. Repurchase? Maybe. If Shiro releases more dye-free colors, absolutely. Otherwise, probably not, since I've found other, cheaper lip balms I like just as much. I also still have one more backup of Longcat to get through. This is another lip gloss-type product that I used in place of a lip balm. The Vegan Kisser Slickers are very moisturizing and amazing for winter chapped lips, though they have a really soft consistency that makes the tube disappear quickly. Repurchase? Probably not. I like it, but again, I've found other, cheaper lip balms I like just as much. I also still have one more of these to use too. I only discovered Badger's Cocoa Butter line this past winter, but they've quickly become my favorite lip balms. (It even made its way onto my list of 15 products I'd repurchase.) These are almost twice the size of an average tube of lip balm and I managed to whip through this one in under three months, which I think says a lot! I love cocoa butter, both for its moisturizing properties and because of the smell. The Creamy Cocoa is unscented, so that delicious chocolate smell comes through unimpeded. This was another new discovery this winter. It can be used as a lip balm, but it also works great for lots of other things. I used it on my rough elbows and even slathered it all over my face a couple times. You can see I cut open the tube to get to every last bit! I'm not really big on hand sanitizer, but it does have its moments. I mostly use it at work, since I can't always get to the bathroom to wash my hands normally. Young Living uses alcohol and essential oils instead of antibacterial nasties like triclosan. I don't use wipes much on my face and I'm not sure it's worth having these around just for cleaning up blog swatches, but that's what they end up being used for most. The canisters do tend to dry out if you have them open for too long, so next time I think the individually wrapped ones will be a better choice for my infrequent use. Repurchase? Maybe, but not right away. Egyptian magic is a popular product, but it's one that I really don't understand the hype about. I used it on my feet, and while it did leave them soft, it wasn't anything spectacular. Plus, the smell was horrible! I'm not sure if my sample had gone off or something, but it just smelled bad and sort of fermented. It also didn't soak in well and made my feet feel uncomfortable and tingly. I have another sample hanging around here and I don't even want to touch it. The Weather Protection Cream is from Weleda's baby line and just as the name implies, it's intended to protect your baby's skin from harsh weather. I used it on my feet instead, and it worked really well for that too. It took a while to sink in, but I just threw on socks before bed and woke up to incredibly soft feet. I think it'd be perfect for protecting my hands in the winter too, as they usually end up getting dry and chapped. Repurchase? Yes, but probably not until next winter. Skin Food is another very hyped product in the natural beauty world and this time I completely understand why! It's a heavier lotion, so not something I'd use all over, but it's perfect for those extra dry spots like your feet and elbows. 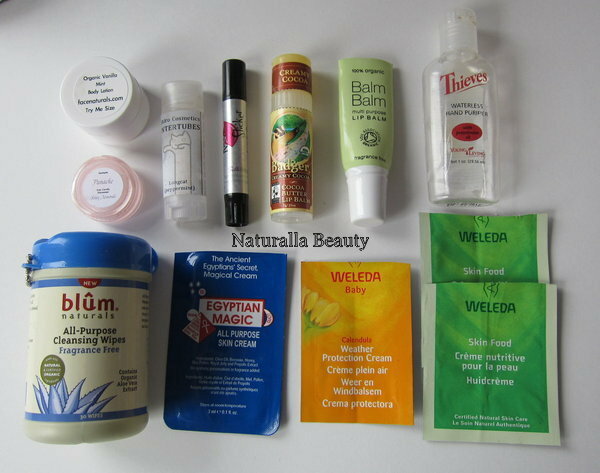 I find a lot of Weleda products are too heavily scented for me, but happily, I don't have any problems with the Skin Food. Repurchase? Yes, I already bought a big tube. I also gave my makeup a bit of a spring cleaning this month and a few things are headed for the bin. I figured I might as well include them too! I don't think SweetPea and Fay makes these anymore, but I really liked them! I hadn't reached for them in a while and when I pulled them out this month they were completely dry. I've never had lip gloss dry up like that, even after more time, so it's a little odd. I got this in a blogger sample pack and I guess it didn't impress me, since I just never reached for it. It's started to smell funny now, so it's got to go! This is from Burt's Bees' old makeup line, which I think is from way back before the company was bought by Clorox, and it's just dried up now. I don't use them much anymore, but I'm still hanging onto a couple of the old lip shimmers from the same time period (they seem fine, honest! ), but the metal tins aren't very airtight, so they're definitely drying out too. It feels great to use all these things up and get rid of some products that just aren't good anymore too! Have you tried any of these? Does anyone else remember Burts Bees' old makeup line? And am I the only one who did not like Egyptian Magic? We had that EMC craze here back then as well! !Everyone raved about it,and I was tempted to buy it.However,I was kinda skeptical since it's nothing but a beeswax combo.But some people swore that the product was like a miracle from heaven. Now I'm glad I didn't buy it back then,since..after all beeswax is pore clogging.At least for me..
Yeah, I think there are a lot of products similar to Egyptian Magic, just for some reason it got big and is pretty well known now. I wasn't impressed, but that's just me. Lots of people do swear by it! I've never had a problem with beeswax clogging my pores. That must be tough - it's in SO many products! Oh,I should've made it clear when I said beeswax.What I meant was any balm with beeswax as majority ingredient in it so that the balm feels sticky.By far only badger who can make balms without sticky feeling with beeswax in it.Perhaps for other area of the body,it's fine.Just make it clear to keep the beeswax away from my face. Btw,are you acne prone Caitie? You should! I love reading them too :) I keep a bag tucked away just for them, then when I finish anything it goes in there. That way the garbage doesn't bug me and they're all together when it's time to do one of these posts. I love love love those Badger balms! I have the mint one and want to try more flavors. So creamy and hydrating. Best thing my lips have tried recently. Me too, they're my current favorite lip balms :) I might have to try the mint one next!